By early 1917 British Empire forces had pushed the Ottoman Turks out of the Sinai to a line near Gaza. If the British could break that line, it would open the road to Jerusalem, and after that Damascus. A hastily prepared attack in March was repulsed. After a month spent bringing forward artillery and supplies, the British were ready to try again, going �over the top� on 17 April. 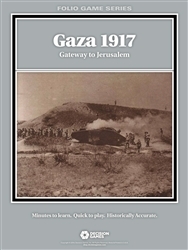 Gaza 1917 uses the Fire & Movement system. The movement and combat systems are designed around the realities of mechanized warfare, giving motorized and/or specially-trained units clear advantages. Players can augment units at the instant of combat with support fire, provided by weapons ranging from mortars through cannon and light ground attack aircraft to heavy bombers. A seemingly predictable assault can be overturned at the last minute by heavy defending fires, while even small units may develop tremendous offensive punch with the assistance of a heavy bombardment. Winning the battle is a matter of maneuver, firepower and asset management. Historically, the Turks eked out a victory, but it was a close call. In this game, the British have numbers, quality, and firepower on their side, while the Ottomans have excellent defensive positions, superior leadership, and time. The player who best utilizes his strengths and is prepared to capitalize on opportunities will prevail.